The Bengals are 6-0 at home, but are having trouble selling out. 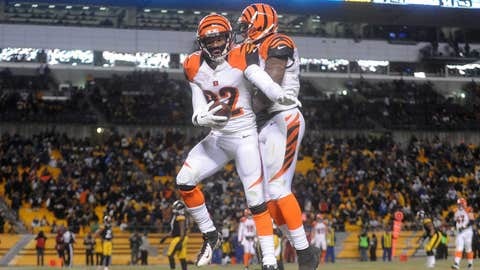 CINCINNATI (AP) — The Bengals are trying to hold onto first place in the AFC North and fill their stadium for two final home games that will decide their fate. They’ve got a lot of work to do in both areas. The Bengals (9-5) need to beat the Vikings (4-9-1) at Paul Brown Stadium on Sunday to move a step closer to clinching the division title. They’ve led the division by at least two games for most of the season, but it’s down to one over Baltimore (8-6) with two games left. "You’ve got to put all your cookies in the basket — however you want to look at it," safety Chris Crocker said. "You’re all in at this point. You’ve really got to win. Just win. Doesn’t matter how it looks, just win." With two weeks to go, the Bengals are still in very good position to make the playoffs for an unprecedented third year in a row. But a 30-20 loss in Pittsburgh on Sunday night tightened things and made a lot of their fans do a double-take. The Bengals haven’t sold out their game Sunday against Minnesota. Roughly 3,500 tickets remain. The league gave them a one-day extension to sell out and avoid having the game blacked out on local television. 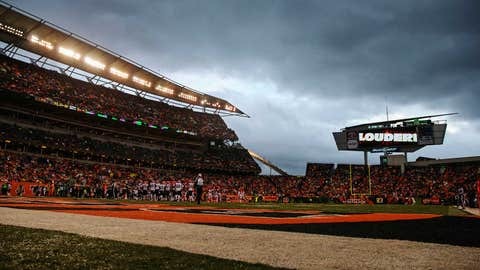 They packed Paul Brown Stadium for the first six home games. As the playoffs close in, they’ve become a tough ticket to sell. The loss in Pittsburgh left a lot of fans with a sense of doom. "We’ll go back this week and play well and everybody will change their tone and all of a sudden we’ll be good again," offensive lineman Andrew Whitworth said. "That’s kind of how it goes around Cincinnati for some reason." Whitworth has become accustomed to playing in front of a lot of empty seats at Paul Brown Stadium during his eight seasons in Cincinnati. The Bengals have gotten better at filling the place in the last few years with their run of playoff appearances, but aren’t yet a sure thing at home. "It’s like I’ve said over my eight years here: It’s always been interesting at times as far as that stuff goes," Whitworth said. "All we can do is continue to put a winner on the field and try to prove who we are and people will come and support us more and more, and hopefully that continues to grow." The Bengals are in line to get the No. 3 seed in the playoffs, behind Denver (11-3) and New England (10-4). They beat the Patriots at Paul Brown Stadium, giving them the head-to-head tiebreaker if they finish with the same record. Cincinnati would clinch a playoff spot with a win and Miami losing at Buffalo on Sunday. They’ll clinch the AFC North title with a win and a Baltimore loss to the Patriots. If both the Bengals and Ravens win, it’ll come down to the final week with Baltimore playing at Paul Brown Stadium. The winner gets the division title. The loser could be eliminated from playoff contention. "Honestly, I think we’re going to win (on Sunday) and I think Baltimore, they have momentum and they’re going to win too," Crocker said. "I think that last game’s going to mean a lot." The Bengals reached the playoffs as a wild-card team each of the last two seasons, then played poorly and lost in Houston in the first round both times. Getting to host a playoff game would be a big step. "There is a lot that can go on in these last two weeks," quarterback Andy Dalton said. "Nothing is determined yet. We have to go out and win these last two games and everything else will take care of itself." "We’ve really got to win because if we lose this game, it’s going to be really ugly," Crocker said. Notes: Whitworth, DE Carlos Dunlap and LB James Harrison were held out of practice Thursday as they recover from concussions. Whitworth sustained his during Wednesday’s practice. … DT Devon Still (back) and CB Terence Newman also were held out. Newman is expected to miss his second straight game because of a sprained knee. … RG Kevin Zeitler, who has missed the last three with a foot injury, was limited in practice.